There is something so satisfying about putting pen to paper in a fresh notebook, and now that the New Year has rolled around, that means new stationary. A notebook is the perfect place to jot down your New Year’s resolutions, write to-do lists, and generally keep your thoughts organised. We’ll hasten to bet that many people don’t put much thought into buying a notepad. For the most part, it’s a case of flinging one into your trolley as you reluctantly traipse round the supermarket doing the weekly shop. But for those who do like their notebook just so, there’s a world of extra special ones out there that are rather like the Mercedes Benz of the stationary world - that bit smarter and that bit sleeker. Looking for a great laptop case? We've got you covered. 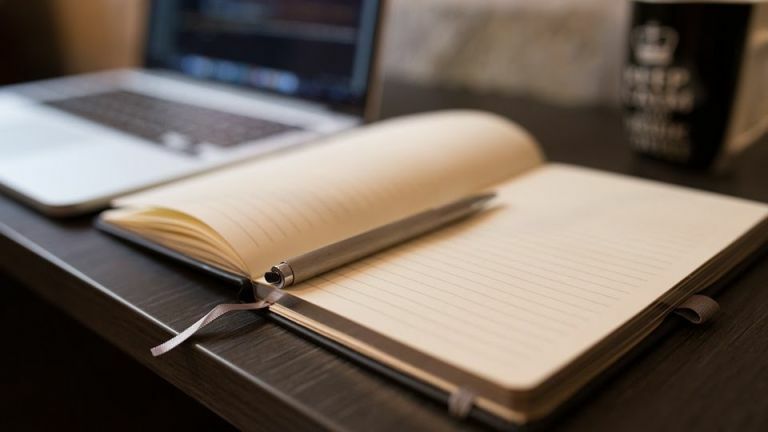 For notebook aficionados, the ins and outs of buying the perfect pad are probably pretty familiar, but for those who are looking to upgrade or trade in their current sorry state for a new model should (excuse us) take note, of the following attributes to look out for. Firstly, the cover. Leather and faux leather covers are the common wrap around for a lot of office-worthy notebooks, and these themselves are available in various shades of brown or black and in a multitude of printed patterns or finishes. Counteracting the brown and black, if you prefer splashes of colour or desire a notebook that’ll add some sparkle to the dreariness of the everyday, there’s also plenty of those around, too: Aspinal of London are a dab hand at the art of combining bold colours and luxury style if that's your ideal stationery combo. Then there’s the size. Those who are looking to slide their notebook into a laptop case or rucksack to easily carry it on the morning commute may want to look at an A5 pad, as A4 notebooks can be frustratingly difficult to force into the corners of your bag in order to get the zip shut! For anyone who tends to burn through notepads quicker than you can say ‘morning meeting’, may want to lean towards a slightly bigger A4 pad and double check the amount of pages, particularly before committing to a non-refillable upper-end purchase, otherwise your newly acquired companion will bring you short-lived joy. Finer things to think about are paper colour and weight if you really are a stationery aficionado. While these are particularly nitpicky, those who can’t settle for anything other than pristine white may want to watch out for off colour, while those who can’t stand thin pages should look out for notepads that have a gsm of 70 or above. Everything about this notebook screams out young corporate, so if you’re looking to impress in the meeting room, this is certainly one to go for. Bound in a smooth, black faux leather cover, and featuring page cutouts that allow you to keep your projects notes separate, this A6 notepad has been well thought out by designer giants Hugo Boss. With an RRP of £40, it’s one of the most expensive on our list, but what can you expect when you’re hankering after designer stationery? Whether you are conjuring up a “Master Plan” or simply want to scribble down the odd inherent thought, this notebook is great for organising your daily life from to-do lists and jotting down reminders. We love the modern design and it comes equipped with a matching pen, sticky notes (because who doesn’t love a sticky note?) and is elastic bound to keep everything secure. White can get a little dirty if you’re lugging it around all the time, but on your desk at work this would make the ideal notebook for keeping organised. If you’re a traditionalist, this notebook should be right up your street. Leatherbound with off-white pages, there’s something oldy-worldy about it that the Hugo Boss pad above doesn’t touch upon. According to the brand, Howick make an emphasis on quality and longevity, which leads us to think that this leather notebook will fair well whether it’s being battered around in a bag or taking centre-stage on your desk. For those who are looking for quality and quantity, this Orla Kiely number offers both a striking design and thick luxurious pages to write on; great for those who write in fountain pen as it does not seep through the pages. This notebook has many more pages than some of the others on the list, which makes it great for those who are constantly scribbling down their thoughts. The striking design will make it stand out from the crowd in the office, and the coloured edged pages give it a professional finish that feels expensive. Any Star Wars fan will love the detailed design of this notebook; from the action drawing of the Empire TIE Fighters battling a Rebel X-Wing, to the useful expandable inner pocket and matching bookmark ribbon so you can keep track of where your latest set of notes are. If the thought of lifting this out of your office bag isn’t cool enough, wait until you discover the free strip of stickers, which you can use to personalise other bits of stationery, your laptop or anything else you see fit. Whilst this notebook is a bit of fun, it's also Moleskine, so you know you are getting a decent quality pad too. Sometimes it's the little things that count - and this notebook from fashion house Kate Spade applies this rule effortlessly. With a quirky, subtly-embossed quip on the front cover, gilded page edges and silk bookmark, this notepad is a thing of beauty for those who are into the rose gold trend (but who also want to avoid the tackiness that is often associated with it). It's an A4 pad and boasts 168 lined pages making it ideal for frequent use, the internal pocket is a handy added extra too. Barbour are kings of the country-chic style (that’s making a hunting jacket and a pair of wellies look street-friendly) and they have extended this to their accessories range. Featuring a classic tartan cover and leather trim, this notebook should bring back memories of brisk country walks with the extended family on the lead up to Christmas... or maybe you just like tartan and nostalgia's not your thing. If you’re looking for a casual yet equally as stylish alternative to our first two picks, you can’t really go wrong with this notebook from countryside fashion champions, Barbour. If you liked the fashion-conscious styling of the Kate Spade rose gold A4 notebook further up our list but are after something a bit more compact this Ted Baker A5 pad might be just the thing. With soft faux-suede cover, a tassel bookmark and gold edged pages there is a lot of be said for its design features. Plus, the pages are reportedly pretty thick which is great for those who opt for a fountain pen as their jotter of choice. If you’re looking for a showpiece, this Amalfi leather bound notebook could be just the thing. Take this out your bag and it could be compared to lugging out an old 17th century volume, as it’s that much bulkier than a regular notepad. But the theatrics of unbinding it and releasing the inner notepad could be enough to convert you from buying a bog standard one from WHSmiths. The overruling plus? It’s refillable, which means this leather bound notebook could be your companion for many years to come. The Filofax is the original notepad that will allow you to refill the pages once you’ve used them all; so technically, you can keep the notebook cover forever. The cover is pretty plain, but this particular range does come in 4 different pastel colours, so most tastes should be catered for. Inside, there’s a moveable index to help you keep your notes organised, and there’s an inside pocket for storing odd bits of paper that you collect on the go. If you want a notebook that can be customised to your needs, then this one is perfect for keeping track of your day to day tasks or that major project at work.